Year 1914 during the First World War. A small town somewhere in the eastern borderlands. The sound of the bell Florian accompanies the inhabitants in all the major events. We see people commenting on an announcement that calls for giving all the items made of precious metals away to the local authorities. Everybody is most concerned about the possibility of losing the bell. The commissioner informs the parish priest that the bell will soon be confiscated. The owner of a court named Wereszczyński acknowledges it from his granddaughter Bronka. On Sunday, all inhabitants gather on a mess. For Alfred, it is a chance to meet with Bronka, a girl he is in love with. At a meeting at parish’s place Wereszyński, the organist, Bronek and Łusia discuss a plan to save the bell and hide it in a close-by lake. Wereszyński’s grandsons are chosen to execute the plan. 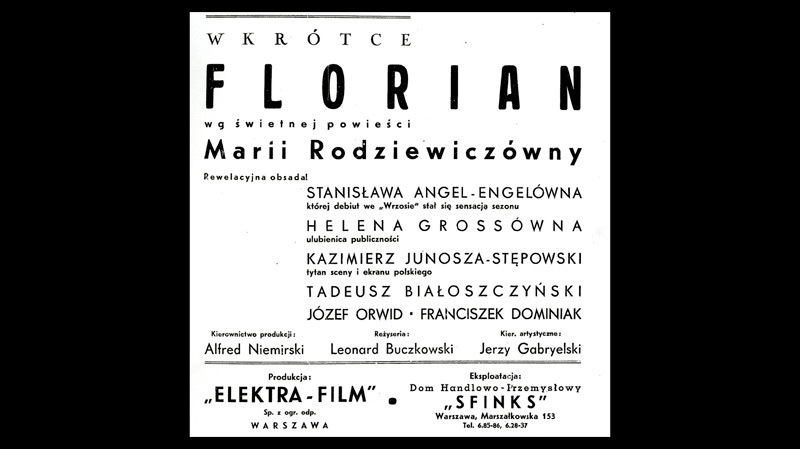 In the night, Gaweł sets fire in the town to distract authorities’ attention away from the action “Florian”. Later on, together with his brothers and a help from Ewa, Łusia, Bronka and Alfred, they take the bell off the church tower and then carry it away from the town. Horehlad, a local informer, starts to suspect something. Soon afterwards, Alfred is sent to the front line. He says words of farewell to Bronka and confesses his love to her. Some fierce battles take place. Many refugees show up in the region. Soon, German troops arrive in the town. Commandant Fischer, who does not believe that the Russians took the bell, starts an investigation concerning the case. The boys meet a legionnaire in the woods. Paweł and Florek decide to join the legion. The German commander graf von Freden chooses Wereszyński’s court for his main headquarters. Skalec, his batman, a Silesian by descent, befriends Gaweł, Szymon and Łusia. Horehlad denounces Wereszczyński. At a hearing led by a cavalry captain, Wereszczyński claims that the bell was taken by the Russians. He is arrested but von Freden decides to let him loose. In an inn, a drunk sergeant Braun shows Horehlad a newly discovered plan of the place where the bell is hidden. Horehlad steals the plan and hides himself in the forest. When he sees Braun riding a horse, he takes a shot at him. When von Schulz acknowledges that a murder took place, he orders to imprison the most respected resident of the town and sets an ultimatum – if in 48 hours the killer is not to be found, the hostage will be executed. Gaweł, in order to save his grandfather, pleads guilty. Ewa finds in the woods Horehlad’s gun. Skalec goes there together with the boys, overpowers Horehlad and leads him to the headquarters. In the meantime, the parish priest pays a visit to Wereszczyński in the arrest to encourage him. The execution is being prepared. At the last minute Skalec brings his captive to the town, Wereszczyński is freed and all the inhabitants greet him enthusiastically. German troops retreat. Bolsheviks arrive. Court’s inhabitants defend themselves. One of the bullets hit Szymek. Paweł and Florek comes together with the Polish army. Szymek dies surrounded by his family. Bronka receives a cable stating that the wounded Alfed is in the hospital. He has got a disfigured face, but Bronka is happy, for he is alive. They confess love to each other. Much to the delight of all the town’s inhabitants, the bell Florian comes back on the church tower.